So this is what we have been up to in the Dominican Republic. Last year's trip to Gri Gri Divers lead to our discovery of a primate skull. We later contacted Dr. Alfred Rosenberger from Brooklyn College in New York. He brought us back down for two more trips; the first to recovery the original monkey skull and the second (last month) to look for more fossils. We are proud to be a part of this great research and exploration and look forward to more expeditions to the Dominican Republic. 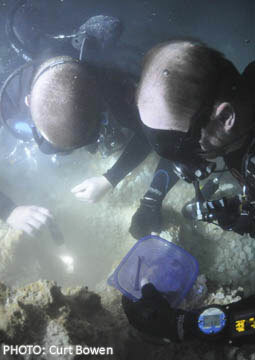 The picture to the left is of Eric and I collecting monkey bones in a small cave; the picture was taken by Curt Bowen. I have also been busy adding new cave systems to the database and adding countries as well -- I have even listed cave systems in Bosnia! If you would like to have cave systems added or would lilke to see other features, please let me know.